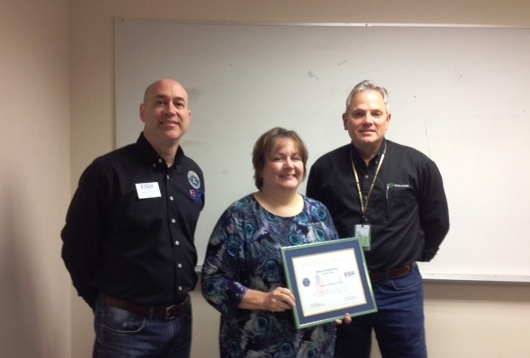 Seattle, WA – The Employer Support of the Guard and Reserve (ESGR), an agency of the Department of Defense, announced today that Donna Kludsikofsky from CenturyLink was honored with a Patriot Award in recognition of her extraordinary support of her employees who serve in the Washington State National Guard and Reserve. As the 1.3 million members of the National Guard and Reserve continue to perform an increasing number of unique missions with America’s borders and beyond, ESGR will continue to be the resource for the employers of citizen warriors. ESGR provides education, consultation, and if necessary mediation for employers of Guard and Reserve employees. More information about ESGR Employer Outreach Programs and volunteer opportunities is available at www.esgr.mil, or by calling (877) 306-1971.